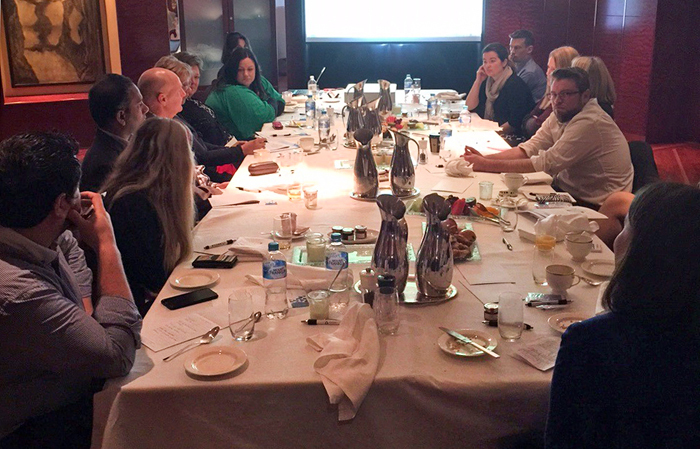 ANCILE plus several customers from the Melbourne, Australia region came together recently for a User Group breakfast event at the Park Hyatt. Instead of the usual two day APUG event in Sydney, this year the Australian ANCILE team are trialling more frequent, smaller, regional events. The benefits of the format change include the lower the cost for customers to attend and the shorter time away from their work place while still enabling them to connect with the ANCILE team and other customers, plus receive some education on ANCILE products. From 8.00am to 10.30am, as well as a delicious hot breakfast, participants were offered an update on our ANCILE Solutions organisation, a demonstration of our ANCILE uGuide and ANCILE uAlign products, provided an overview of the four default webskins that are available with ANCILE uPerform, plus there were plenty of opportunities to network and ask questions of the ANCILE team and one another. If you’d like to comment on the format of the frequent, smaller, regional ANCILE user group events or request an event in your local area, please let us know and add your comment to this blog article.